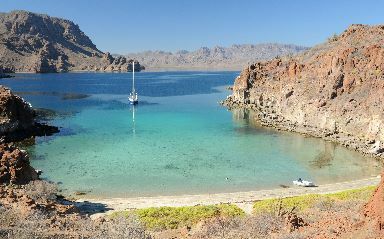 Our cruising lately can best be described as floating up and down the Sea of Cortez with the tides. We've pretty much been "stuck" in the same area with minor changes in location. Believe me, this is not an issue as this is definitely some of the most beautiful scenery in the Sea and it's been extremely enjoyable to just sit back and enjoy it without feeling the pressure to be constantly moving. When I last wrote we had stopped in Puerto Escondido for a day to do laundry, get some veggies, fuel and connect to the Internet. From there we made a whole 8 mile jump to Bahia Candeleros which is a nice big bay with a new resort that welcomes cruisers. Even better, they have the best Internet connection that I've seen in the Sea. You're even welcome to come in and use their facilities. All that they ask is that you purchase food or drink from them. Wow, that's tough! So, everyday we'd do boat projects during the day and then head into the resort (with a lot of other cruisers) to enjoy the 5 pools and happy hour. Speaking of boat projects, one of the things that we did was to make a cover for the cockpit table to keep it out of the sun when we stored the boat. I measured, laid out the pattern and cut the material and Sue sewed it. It's a bit cramped to do this on a boat, but we managed. We hung out there for a few days and then decided to head to the SW end of Isla Monserrate, but on our way over there we noticed a large SE swell, which would have made our anchorage untenable. On top of that there were N winds coming, which meant that the N anchorage there wasn't usable. What do you do when you can't use anchorages with N or S exposure?!? Well, we headed back to Honeymoon Cove on Isla Danzante and hoped that one of the very tight anchorages wasn't taken. Thankfully the smallest anchorage was available (although it was filled with 20-some people playing in the water), so we nudged the boat in, dropped the hook in the light green patch at the entrance, backed out and put out a stern anchor to keep us from swinging into the rocks. Beautiful! We then spent the next 3 nights at anchor in Honeymoon cove, which is named that way as there's only room for one boat. I managed to get a few dives in at the S end of the island and if you're a diver, information about them is located at the bottom. 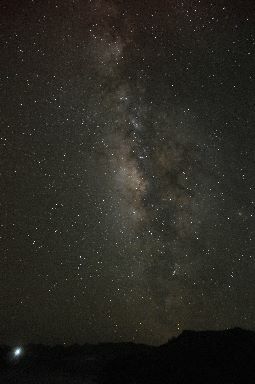 One night I got up and was struck by how incredibly bright the Milky Way was. I had been looking for a location where I could get off the boat and photograph it and this was perfect. There was a nicely marked trail which lead up with surrounding hills, so the following two nights I got up at 3 AM, took the dinghy in and trekked up the trail. Believe me, it's much easier in concept to find the trail and hike it than it is in reality, especially given the loose scrabble which coats the trails. Anyhow, it was well worth it as shown by the photo to the right. I had thought that we had our hurricane storage location all set, but after talking it over with Sue, we decided that storing the boat in La Paz, which is on the Baja side, was a better option than storing it in Mazatlan, which is on the mainland side. The Marina Fonatur in Mazatlan is much more exposed to storms than the Fonatur in La Paz. Hurricane Bud, which already struck Mexico's Pacific coast, drove that point home. As a result we headed back into Candeleros to use the Internet and nail everything down. We spent a solid day making marina/hotel/car/flight reservations and got that nailed down. Flying out of Cabo San Jose saved us hundreds of dollars, gave us a choice of 6 flights a day instead of 3 flights a week and will allow us to get back in 1 day instead of having to stay overnight somewhere along the line. 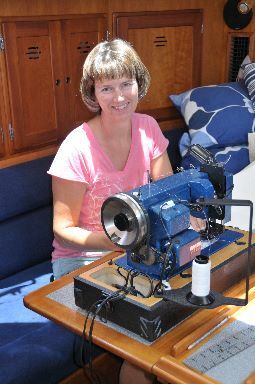 In addition there are 3+ well stocked boat stores which will make finding parts much easier. Plus we know La Paz quite well, which will make provisioning much easier when we return. After getting that done we headed to Isla Monserrate, but that's a log for another day. We hope that you're having a nice spring! I dove Danzate reef at N25-45.29 W111-14.41 and had one of the prettiest dives of the season. Beautiful walls encrusted with soft corals and fans. Lots of big fish. Visibility was poor and it was cold, but it was a good dive. I also dove the small islet just off the S end of Danzante which is marked as dive site in Shawn & Heather. Nothing exciting as it was pretty much just boulders in 30-40'. Lots of small-medium fish. If you headed SE off of the islet you'll find nice walls and deeper waters, but I was too far from the dinghy to explore this. Be careful about currents through here. I tried diving this area one time and I couldn't swim against the current. Time your dive for around slack tide.